Where Is the Best View in Omaha? | Omaha, NE Real Estate Agents The Bill Black Team Video Blog Omaha, NE Real Estate Agents The Bill Black Team Video Blog: Where Is the Best View in Omaha? Where Is the Best View in Omaha? Welcome back everyone, we've got some exciting news today. We have just launched our latest website, 555omaha.com and we want you to visit! What's with this site, or the name, for that matter? 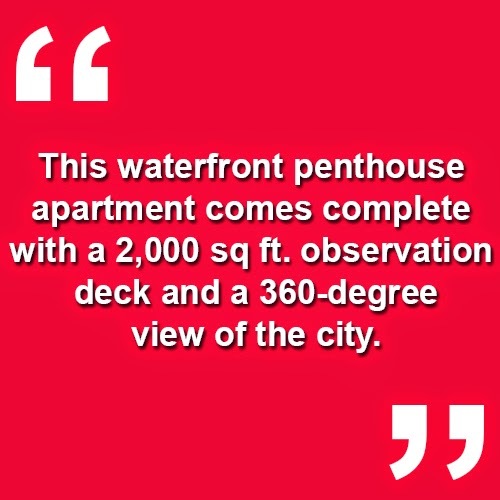 In today's video, we are at 555 Riverfront Plaza, one of our most recent listings. You can't pay for a view like this. This waterfront penthouse apartment comes complete with a 2,000 sq ft. observation deck and a 360-degree view of the city. For a virtual tour of the property, including the many great views it offers, watch our video above. If you happen to have any questions for us in the meantime, you can always reach us via phone or email. Thanks for stopping by, we'll talk to you soon!